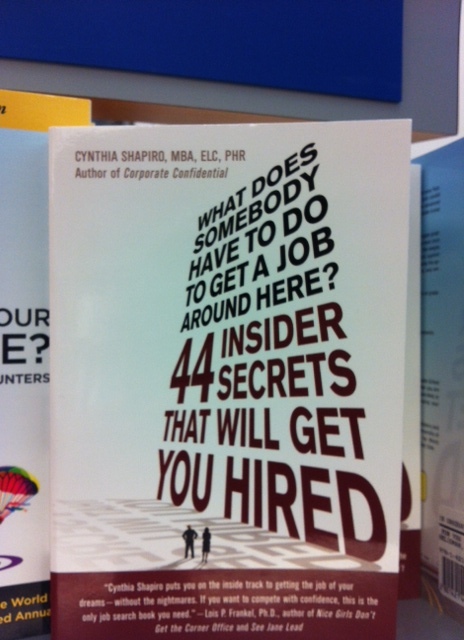 I stumbled upon a shelf or two at the bookstore filled with career advice books for undergrads and other job seekers. I was quite curious and leafed through some. And, I took photos of a few of them. I’m sure that many of these books dispense good advice for job seekers, and given my penchant to read as much as I can I think it’s good to do your homework. But, there is a part of me that also hopes that students go to the Career Center or whatever name it’s called on campus. Here are some screen shots of some of the books that I leafed through the other day. I didn’t see anything Earth shattering in the above book–but it does have a snazzy title and will definitely cause some to buy it hoping that the right equation is there for them. I’m not dismissing the book or endorsing it. But, it does catch the eye! I wonder how many copies of this book have sold? 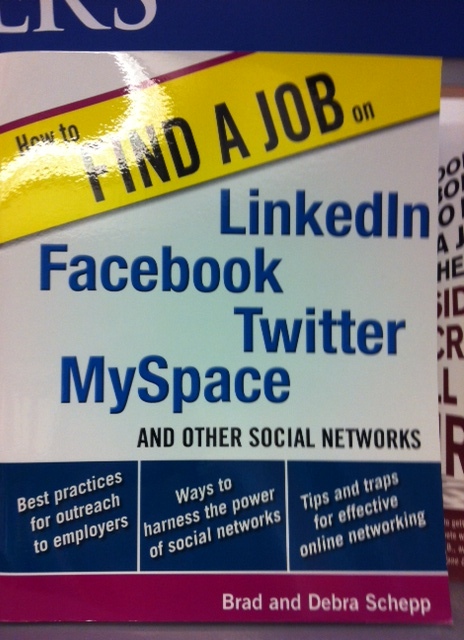 You, too can use Social Media to help you get a job. Yes, you can, but just being on social media is not enough. Big smile. Mind your digital footprint. It’s always good to occasionally Google yourself and see what is out there. Clean up your presence if you must. There are reputation management companies to assist you with this, too! Hopefully, most won’t need to resort to the consultant to clean up the digital footprint! I’ve read the Parachute book and back in the day found it helpful. No wonder it’s been repeatedly published. Many people have no clue what they want to do and books like it are useful to get you thinking about the possibilities and the reality of your own skills and interests. And, nothing beats talking with a career educator, mentor, coach or trusted person in your life. Which brings me to my next thought–I really hope that students scouring the shelves in the university bookstore look to their network as a rich resource, too. Start off with your friends, family, profs, employers, and the career center! Set up coffee meetings and ask that contact to introduce you to a person or two so that you can increase your networks. Another screen shot of a book and its secrets! 44 Secrets! Now, some of them make me think of Captain Obvious, but I’ve been working since I was 16. 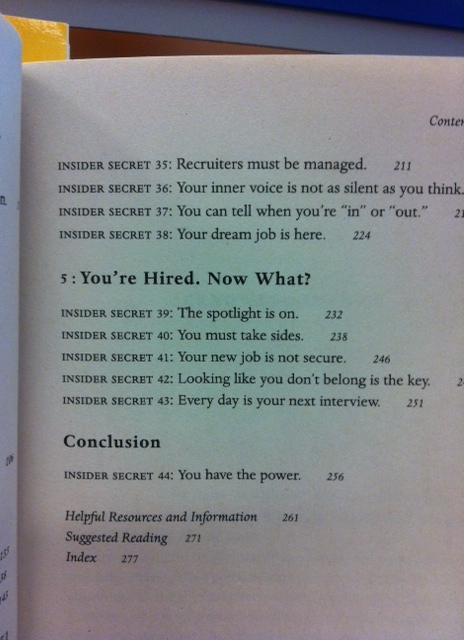 I do think that the book has lots of great hints/information for the job seeker. It looks helpful in a cheeky sort of way. I should have taken more photos of the table of contents, as this book really made me laugh out loud. I liked the section about: You’re Hired, Now What? This is also an important part of the job seeking process. What to do when you get hired. Some of the best advice that I’ve heard about once you’ve been hired is that you act and dress for the job you want. I’ve had other great advice, too. You know–keep your head down and work hard, avoid landmines, make good allies, and don’t piss off the more senior people. This is a quick list of some of the advice and certainly not exhaustive. I have lots of former students on the job hunt right now and I wish each and every one of them good luck. If any of these books look promising, stop by a bookstore and leaf through it before you buy it. And, remember that we have a great Career Center on campus! Have one of the career educators review your resume and a sample cover letter. The staff or mentors on campus are here to help and you want to represent yourself in the best way that you can. Good luck! I’ve been thinking lots about this last school year. It was a really amazing one in terms of my academic career. In the Fall I was unanimously endorsed by my colleagues for reappointment. While I hoped and suspected that my reappointment would be smooth to have it behind me was a big relief. I can only imagine the stress involved with the tenure review. I have now loaned my binders to a friend for her own review. If you’re up for your first review here are some points of advice. I assume and hope that some of my friends will respond and add in their two cents about the review process. Document all that you do. This is easier said than done. Make sure that your CV follows the department or faculty norm. 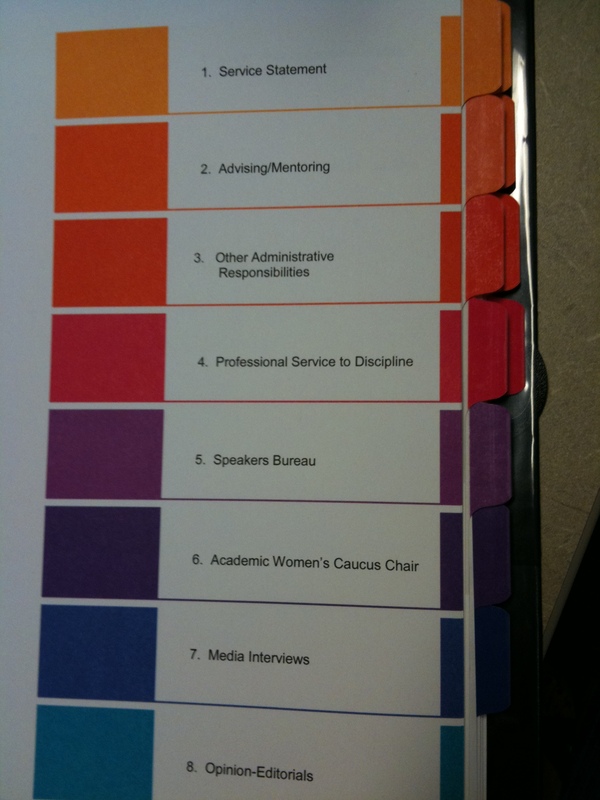 Speak to a colleague or mentor familiar with the department or faculty process, so that you have an inside view. Review the Faculty Agreement/Contract or similar document to make sure that you are familiar with all the guidelines. Meet with the department Chair to review the process. Get as much input as you can from the Chair. Make sure that someone else (mentor/friend) reviews your dossiers. 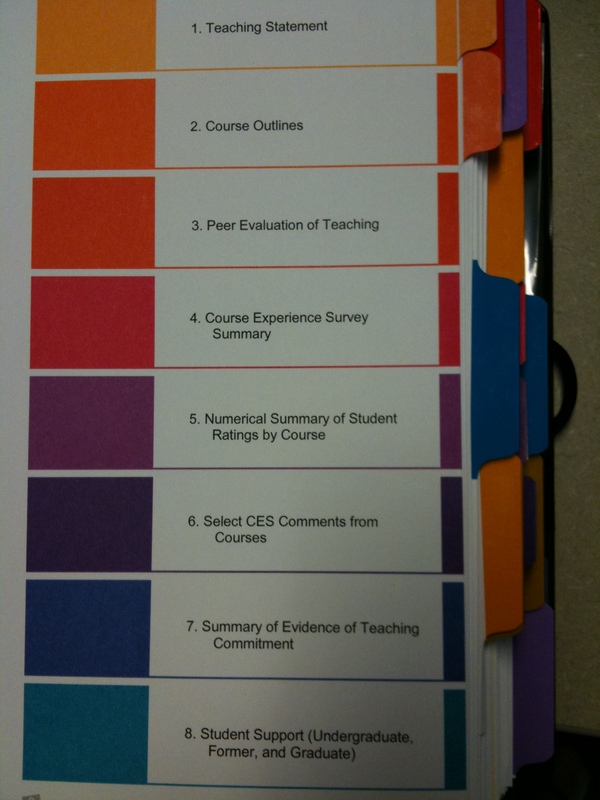 I had to put together a Teaching Dossier and Service Dossier. But, most will need a fulsome Research Dossier. I had to include all my course syllabi and Course Experience Surveys. I was also able to include the verbal comments from courses of my choice, but if I included comments I had to include all. I opted to include comments from one 1st year, 3rd year, and 4th year seminar. I teach an array of courses and felt that I needed to demonstrate my effectiveness among all my courses. It’s easy to pick the class with the wholly positive reviews, but you might want to think about the comments that best highlight student learning. (Remember that my position is full-time, tenure-track, and teaching focused). Related to teaching–you might have more senior to you colleagues sit in your class and review your teaching. Review the guidelines, as you should have a choice of who reviews you and when. And, you should have a right of response for the review or be granted another opportunity. I was supposed to have one course reviewed twice. I requested two courses and was glad that I did so. Given that my position is teaching focused, I thought that this would best represent my teaching skills. 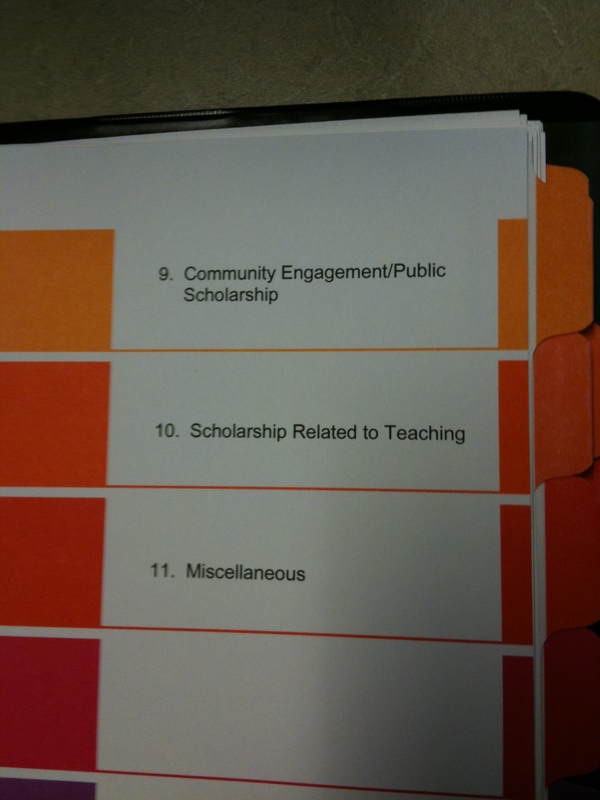 I’ve included screen shots of my two sets of Table of Contents. These fit the norm of the department, so verify what is the norm for your department. Overall, I would suggest that you take 2-4 weeks to put together your dossiers. And, during the review process be nice to yourself. Try to not stress about the review and stay focused (word choice) on each step that you have control over–which is little! Good luck! This post is going to offer some suggestions for students who are entering the job market. Some of my suggestions were shared previously, but they are worth repeating. 1. Go by the Career Services or similar offices on your campus. Usually Alums can also use this service. When there check out the services. 2. Chat with your mentors. If you don’t have any–chat with your current or former professors. If you feel unsure, then contact the Undergraduate Advisors and chat with her/him. Let this contact know that you’re on the job market and see if they have any suggestions for you. Ask this person if s/he is willing to review your resume or CV. Let everyone in your network know that you are looking for work. (This might include your partner, girlfriend/boyfriend, parents, coworkers, pastor, coach, etc. Make coffee appointments or other appointments with people and come with your resume in hand. Let people know that you are looking for work. Ask your contacts if they have any leads or suggestions for you. Offer to take the person out for coffee…chances are that you’ll go dutch or the other person will want to pay, but you really should be willing to offer. Research if there are other means of engaging in the community–social media, Chamber of Commerce, and other groups related to your area. Sleep, eat right, exercise, and try to save money or spend as little money as possible as you’re set on your job search goal. Make sure that you’re willing to take a job that isn’t your career. This job might help you get to the next step. Don’t dismiss the job. The connections you make might turn into gold for the next job or get you toward your career goal. Try to coordinate a mock interview with a few trusted friends–preferable people who have interviewed more than you. Think about the questions you might get asked and work out answers. You might even practice in front of a mirror. During the interview, remember that it’s acceptable to pause for a second–get your bearings and then answer the question. e. Send a thank you card after the interview. Keep it simple: thank the person, committee or team for the interview and note that you look forward to hearing from them. f. Do not bad mouth the company or any of the employees on any social media. Try to negotiate for more pay or benefits. It doesn’t hurt. Particular to women–we tend to not negotiate and accept the offer. Review the offer with someone who you trust. Do not involved your parents in the counter offer—your mom or dad should not call and complain about the offer! Work in the position like you are in probation. You might be on probation! So you have to prove to your employer why you are invaluable. Dress for the job you want and not just the job you have. Be professional in dress (note 8 b) and in your attitude. Remember your job does not necessarily define you. Each job can provide you useful experience and build your resume. You’re in your last year of university and getting nervous as the school year starts, hits the half way point or is ending. But, for the sake of ease, let’s pretend it’s mid-way through your last year of university. I’m going to make some suggestions for you. And, these are my opinions alone and not endorsed by my employer. This advice comes from my university experience, 14 years of teaching, and years of advising unofficially and officially. 2. Speak with your departments Undergraduate Advisor. Believe it or not, s/he might have some good advice to give you. The advisor might know of additional job boards in your area of interest. See if this person is willing to review a cover letter or your resume. If they are not–don’t get offended–go back to number one and ask for help at the Career Services office.